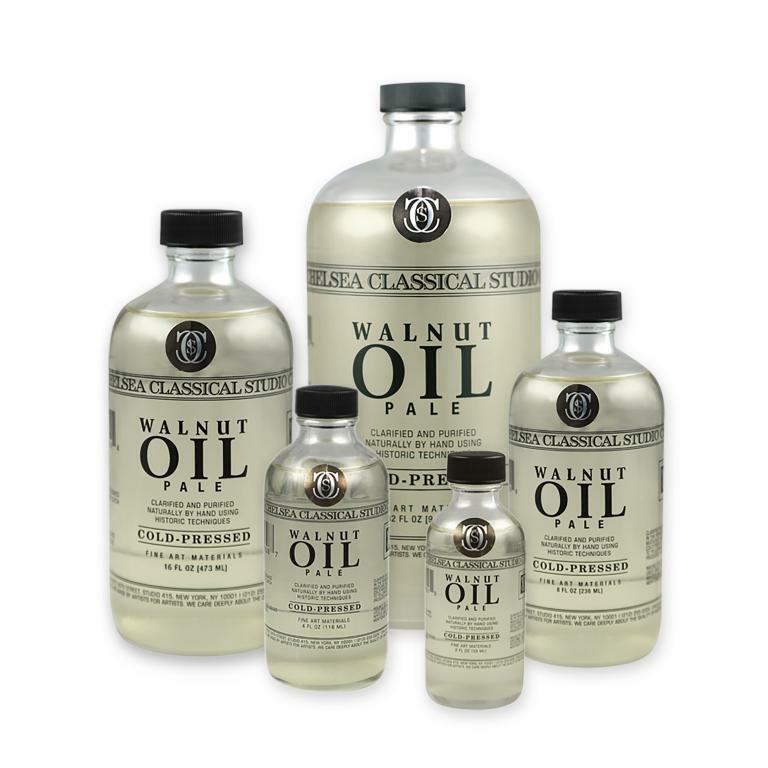 Chelsea Classical Studios Walnut Oil Pale Cold-Pressed is extracted using the more costly, time-tested method of cold-pressing oils. This method follows historic precedent by using the most natural oil and extraction processes. CCS does not use high-heat or chemically extracted oils, which have many more impurities than cold-pressed oils, and because those processes may alter the oil’s natural properties. Walnut oil is naturally less yellow and dries slower than linseed oil. Leonardo Da Vinci recommended walnut oil, and from the Renaissance onward it was used for whites and light colors. Raw cold-pressed oils have a dark yellow-orange color that can affect paint color. Most art material companies either sell the uncleaned raw cold-pressed oil, or use harsh chemical cleaning and bleaching processes to make the oils lighter in color. CCS Walnut Oil Pale Cold-Pressed is washed and cleaned using natural processes documented since the Renaissance.